The actors and friends joined 80 adventurers on a six-day trip across India in an effort to raise awareness about the endangered status of Asian elephants. 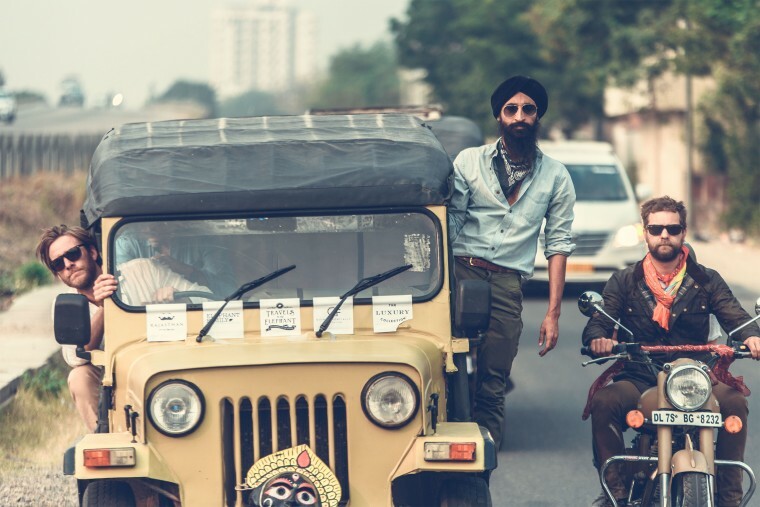 When director Wes Anderson asked actor and fashion designer Waris Ahluwalia to design a pin for his costume in 2007’s “The Darjeeling Limited,” Ahluwalia looked to a consistent source of inspiration for his work. After filming wrapped, Ahluwalia reached out to conservation non-profit Elephant Family to sell versions of the pins for charity. He has been a supporter of the organization ever since, participating in efforts to save the Asian elephant for the past 10 years. “I imagine myself sitting with my future children, flipping through a picture book and showing them animals and having them say, ‘What’s that?’ And I would say, ‘That’s an elephant.’ They would ask, ‘Can we go see it?’ and I would say, ‘No, because we killed it, because it went extinct,’” said the former Gap model. According to the World Wildlife Fund, about 100,000 Asian elephants existed at the start of the 20th century, but populations have fallen by at least 50 percent and continue to decline today. Destruction of habitat, human-animal conflict and poaching have all contributed to the species’ endangered status. “To say to any child on the planet that I didn’t do anything to stop it is unacceptable to me,” Ahluwalia said. The Sikh-American activist recently combined his efforts with a sense of adventure: driving a variety of vehicles — ranging from rickshaws to Gujarati chagdas (half motorcycle-half wagon vehicles) to vintage Jeeps — Ahluwalia and a team of friends journeyed across India’s Rajasthan state in six days. The journey kicked off on Oct. 31 in the city of Jodhpur and concluded on Nov. 5 in Jaipur, a trek totaling over 300 miles. They were joined by 80 other “adventurers” from around the world, including friend and actor Joshua Jackson (“Dawson’s Creek,” “The Affair”). Jackson happened to have a short break in his schedule and jumped at the chance to visit India for the first time. “Purely for the adventure, I was in a hundred percent. But then to have an adventure like that and use it for a good cause to raise awareness, to raise some money, there’s no reason it’s not a win-win for me," Jackson said. The group set up an online fundraiser ahead of their trip, with a goal of raising $35,000. The journey was the second trek in the Travels to My Elephant series, inspired by Elephant Family founder, Mark Shand, and his book, “Travels on My Elephant.” Ahluwalia participated in the inaugural journey in 2015, traveling via auto-rickshaw across the state of Madhya Pradesh in central India. “It was absolutely magical. As someone who was born in India but has not obviously seen all of it or even a third or a quarter of it, it was amazing to go through rural India like this,” Ahluwalia said. I imagine myself sitting with my future children, flipping through a picture book and showing them animals and having them say, "What's that?" And I would say, "That's an elephant." They would ask, "Can we go see it?" and I would say, "No, because we killed it, because it went extinct." The experience also prepared him for the hazards the team encountered throughout the sophomore trek, like epic traffic jams. In Madhya Pradesh, it meant being stalled by herds of goats and chickens. “This time, in Rajasthan, we had a similar thing, but it was camels. We were stuck behind 50 or 60 of them,” he said, laughing. For Jackson, the road hazards meant engaging in games of “chicken” with oncoming traffic, like when he first got on his motorcycle into a two-lane road. Jackson and Ahluwalia were also roommates throughout the trip, which, Ahluwalia said, made for its own hilarity. “It was like going back to college,” said Ahluwalia. Along the way, the team stopped at local schools and villages. Ahluwalia and Jackson both said they hope to shed light on the more nuanced causes of the Asian elephant’s endangerment. This includes human-elephant conflict, which often arises when people live and farm in so-called “elephant corridors” or strips of land elephants travel on. The interaction can have tragic consequences: at least 15 people were trampled in the Indian state of Jharkand this year. “These issues of conservation are not just about saving the elephant. They’re wrapped up in social justice. They’re wrapped up in human rights,” said Ahluwalia, who added that relocating villages to higher ground and setting up communication systems — like an SMS-based one where villagers text each other an elephant’s location — are just some of the ways conflict can be mitigated. “When I speak about compassion for elephants or wildlife, it has to be compassion for everyone. You have to understand where that villager is coming from and how we can help them solve their problem as well,” Ahluwalia said. And while the trek wasn’t officially a race, Ahluwalia said that, despite the exhaustion and harrowing road conditions, the El Banditos fared very well.